Your baby or toddler probably has a few things on his mind regularly, like “What’s that in my diaper?” “It’s time for a potty visit!” “Where’s my cup?”, “I’m hungry!” or “I need a drink!” The simple signs in this article relate to those things and will get you and your baby on the right track with two-way communication beyond “waaaaaah!” Good luck. 1. Make an L with both hands by pointing your index fingers up and holding your thumbs out to the side. 2. On both hands, close your index finger and thumb together. 3. Place your hands near the top of where a diaper would be, around the waist area. 4. 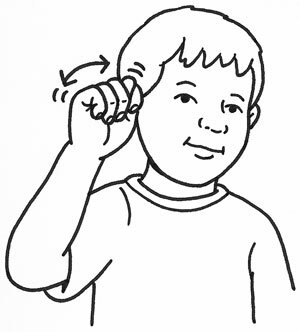 Open and close your fingers and thumbs two or three times (see Figure 1). Figure 1: Change my DIAPER, please. Signing for a DIAPER change is a wonderful thing, but signing for the POTTY is even better. Just think, no more diapers to clean up. Note that if your baby is too young to use the potty yet, you can always introduce the sign anyway, just so baby can hear the word and see the sign regularly. And if baby has a big brother, regularly say and sign POTTY with big brother while in the baby’s presence to keep driving home the point of the potty. In other words, in this particular case it’s okay to have a potty mouth. Say and sign POTTY all the time. The payoff down the road is huge. 2. While your hand is still in a fist, make an ASL letter T by placing your thumb between your index and middle fingers. 3. Shake your hand back and forth a few times (see Figure 2). Figure 2: Time to go POTTY. CUP is one of those handy multipurpose signs — useful for all types of cup situations. The CUP sign will come in handy during your little one’s transition from baby bottle to big-boy cup. And the same CUP sign can be used for communication when your little one is trying to get into Mommy or Daddy’s cup. Additionally, your baby can use the CUP sign to actually tell you when he’s thirsty and wants his cup. 1. Form the ASL letter C by rounding your fingers and thumb. In other words, make an O with your fingers and thumb and then open up a little space between them. 2. 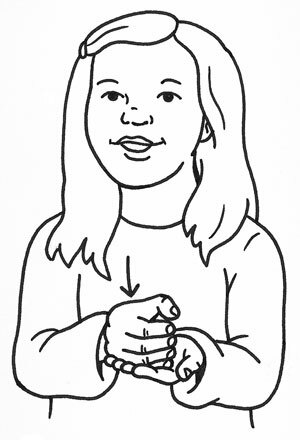 Place your C hand on your opposite hand’s open palm (see Figure 3). Figure 3: May I have my CUP? So you’re sitting on your last nerve in the playroom while Mighty Lungs is screaming at the top of his lungs beside you. You simply can’t figure out what he wants. He swats away his teddy bear and favorite toys when you offer them up. He’s not sitting in a poopy diaper. He’s not cold and doesn’t have a boo-boo. What? What? You notice that he stops his waaaahs as he spots a Cheerio on the floor. Before you can intervene, he picks it up and pops it in his mouth. Momentary bliss and enchantment ensue as he looks around for more yummy floor nuggets, but upon finding none, he starts screaming again. Duh. You realize that he’s probably hungry, so you scoop him up and head straight to the kitchen for a snack. 1. Make a flat-O hand shape by first forming an O with your fingers and thumb and then flattening them out so that they look like a deflated balloon. 2. 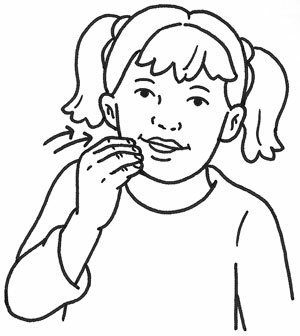 Touch your fingertips to your mouth repeatedly (see Figure 4). Figure 4: I’m ready to EAT! 1. Form an ASL C with one hand as if you’re holding a drink. 2. 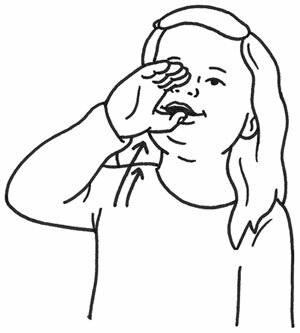 Mimic drinking by bringing your hand to your mouth and tilting it several times (see Figure 5). Figure 5: A DRINK sure would be nice right about now.